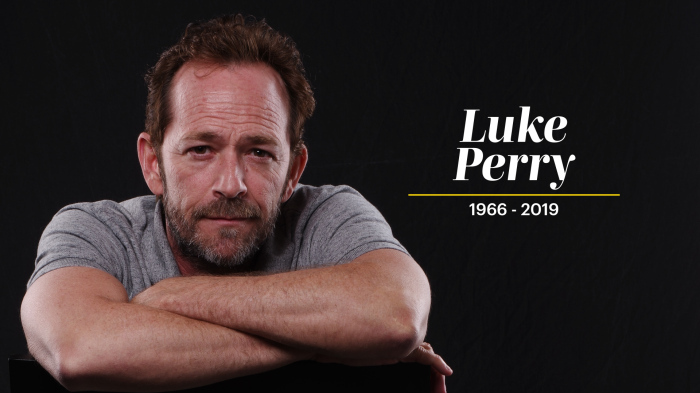 Whether people remember Luke Perry was every 90s girl’s first pretend boyfriend, the heartthrob and mysterious bad boy of Beverly Hills 90210 or the ruggedly handsome father of Archie Andrews on Riverdale, Perry was a good man according to many of his co-workers. He was seen as a bright soul that brought joy into the world, and is now tragically gone too soon. On Wednesday Feb. 27, Perry was hospitalized after paramedics retrieved him from his California home where he suffered a stroke. Though he was responsive when help arrived on the scene, his condition continued to worsen. Doctors decided to put him under sedation in an attempt to allow Perry’s brain to recover, but unfortunately, the damage was too extensive. At the time of his passing, he was surrounded by his children, Sophie and Jack, ex-wife Rachel Sharp and fiancée Wendy Madison Bauer. According to other reports, he was also accompanied by his mother, stepfather, brother and sister. Perry was well respected and admired by both those close to him and those he crossed paths with over the course of his career. The positivity he put into the world is being described by many, as news of his death continues to send a wave of shock through his adoring fans. His kind nature was reflected in the admiration and joy that others felt because of him. She spoke about his overwhelming love for his children and how she believed that, to him, they were his greatest accomplishment. Jennie Garth, who starred alongside Perry in 90210 as Dylan’s girlfriend, Kelly Taylor, also expressed her grief. Following his passing, both children have received a vast outpour of love and support from friends, family and especially his fans. They have each taken to their social media to acknowledge friends and fans amidst their grief. Perry will be remembered by many as a rare soul, and a man who was loving, generous and humble. He was a warm and friendly face. He was described as a protector, mentor and the kind of man one could go to for pearls of wisdom. He was good towards everyone he met and went out of his way to do simple acts that made people truly happy.